This limited edition of 100 published in the Centenary year of the opening of the Great White City covers all the exhibitions held there from the 1908 Franco-British Exhibition to the Anglo-American Exposition in 1914 and is the most complete record of the post cards published for these exhibitions ever compiled. A hard back with 664 A4 size pages weighing 5¼ lbs, profusely illustrated it is an interesting read, and goes much further than just a list of post cards. For the first time the problems facing Valentine & Sons the firm that secured the sole concession to produce the Official post cards for the White City is gone into, and how they tackled the problem is explained in detail. It is not known how many postcards Valentine’s sold at the White City exhibitions, but it could have run into a hundred million or more. In case this seems an incredible and unbelievable figure Consider that in 1924 just before the British Empire Exhibition opened W. P. Hartley the jam and preserve manufacturers took delivery of three million coloured and seven million sepia postcards advertising their products. When one considers that in a year a collector regularly doing the fairs may see perhaps five or six Hartley post cards, but in the same time, will see a hundred times as many Valentine White City Exhibition post cards this estimate does not seem so far out. The same proportion in dealers stocks, applies to some of the L. & N. W. Railway post cards which reached printings of 10 million. For the first time the author’s research has revealed how Valentine’s managed to have kiosks full of post cards on the opening day of an exhibition. How over 160 visitors to the exhibitions in one’s, two’s or small groups had their pictures taken by photographers without their knowledge, which were then carefully cut out and pasted onto empty views of exhibitions several years later. Some visitors were used three or four times in this way, in fact the postcards of the 1910 Brussels Exhibition were almost entirely ‘peopled’ by cut-outs from the Franco-British exhibition held two years earlier. It was so well done, that it has gone un­noticed for a hundred years. Also covered in some depth is how Valentine managed to paint out undesirable people or objects intruding on the views, like workmen with a lawn mower or ladders leaning against a wall, even to chimneys on the sky line, views altered when a card was re-published at a later date. Many cards are listed as ‘with workman’ and ‘without workman’ as the case may be, with many of the differences illustrated. Looking for matching pairs of the same card with alterations has added a major interest to the author in collecting post cards. If nothing else has been achieved, this book will make exhibition post card collectors look at their cards more closely in future. Valentine’s went to enormous trouble to ensure their post cards were as accurate as possible. When at the end of 1909, trips in the Swan boats were discontinued and the boats sold off, Valentine’s went through all their views with Swan boats, they intending re-publishing in 1910 for the Japan-British Exhibition carefully painting out every Swan boat in sight. While the book does not illustrate every post card, where there are series like the Hagenbecks where every card has the same title, then here every one has been illustrated. Many titles used repeatedly like ‘Court of Arts’ 15 times, ‘Elite Gardens’ 13 times, and ‘Court of Honour’ which was used on 32 different views have all been illustrated and given reference numbers. 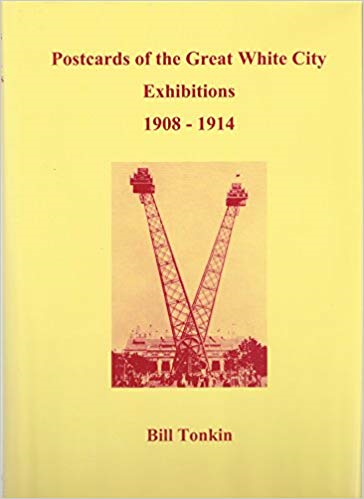 Thanks are due to many exhibition collectors from near and far who have contributed to make this book as complete as possible and to name a few responsible for major contributions, John West who’s knowledge of the Hagenbeck cards has thrown a new light on these issues, Ernie Goleby and Reg Stonnard of Australia who have helped enormously with the Official Government Franco-British Queensland post cards which were published with no less 37 different coloured backs. This daunting task has meant a specialised list of these cards has never been attempted before, and in this book fills 18 pages. Also David Parry of America who made available a detailed list of every card in his collection. Thanks are also due to the Exhibition Study Group who have funded the publication of this book. Awarded Postcard Traders Association’s Chamberlain Trophy for outstanding research.